If you are thinking about investing in a salt water pool, here are some of the health benefits! Deciding between freshwater or saltwater for your pool can be tough because they both have great advantages. 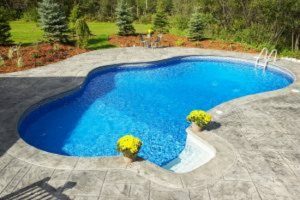 Saltwater pools are starting to become more popular as time goes on because they offer some benefits that a freshwater pool can’t. Here are four health benefits of a salt water pool. When you swim in a pool full of chlorine, it can leave your skin very dry and itchy. Saltwater has actually been proven to be good for the skin and can leave your skin soft and smooth after a dip in the pool. Saltwater has been shown to help with some skin disorders such as eczema and acne. It is a natural moisturizer and exfoliant. A salt water pool helps to induce our body’s natural relaxation process, which makes it a great place to exercise. It provides you with a more relaxing environment to exercise in versus the gym. Swimming is a great full body workout and makes your body work harder since you’re submerged in water. A saltwater pool is better on the joints than a freshwater pool with chlorine in it. Saltwater has bromide in it which is a mineral that naturally helps to relieve aches and soreness within our muscles. This is great for people who suffer from arthritis or just someone who is sore after a long day and wants to relieve some of that pain. Too much chlorine in your pool can do damage to the eyes and the skin. Too little can lead to nasty algae growth at the bottom of the pool. With a freshwater pool, you manually control chlorine levels so it can be easier to accidentally put too much or too little. A saltwater pool controls chlorine levels on its own so you don’t have to worry about your eyes or lungs being irritated after a swim. Contact Paradise Pools For Your Saltwater Pool Today! This entry was posted on Friday, April 27th, 2018 at 11:37 am. Both comments and pings are currently closed.